The Province of Ontario has appointed Dr. Alan Hudson as the Chair of eHealth Ontario, a restructured agency responsible for all aspects of eHealth in Ontario including creating an electronic health record for all Ontarians. eHealth Ontario will bring together the Ministry of Health and Long-Term Care's eHealth program and the province's Smart Systems for Health Agency (SSHA) under one banner. Three key eHealth priorities have been identified for the next few years including a Diabetes Registry, an eHealth Portal to centralize health information on an easily accessible web site, and ePrescribing which will eliminate hand written prescriptions and reduce medication errors. Dr. Hudson - who is leading the government's efforts to reduce wait times in emergency rooms and for key procedures - will chair the Board of Directors for eHealth Ontario, which will have individuals from the broader health, business and information technology sectors. "This is an exciting time for eHealth in Ontario," said Dr. Alan Hudson, Board Chair for eHealth Ontario. "Combining thought leaders from the Ministry and Long-Term Care and the broader health sector means we now have the expertise to make electronic health records a reality for the people of Ontario." 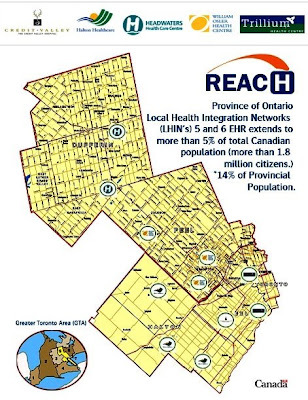 The ultimate goal of the eHealth strategy is to create an electronic health record (EHR) for all Ontarians by 2015. An electronic health record will provide patients and providers with the ability to access, share and use health information. It will improve health care delivery, increase patient safety, reduce ER wait times and create a more effective health care system. "eHealth Ontario will enable us to transform Ontario's health care system as we know it," said David Caplan, Minister of Health and Long-Term Care. "With its broad mandate, eHealth Ontario will deliver a comprehensive, patient-focused, secure and private electronic system that will improve the way patients receive care." - eHealth Ontario is mandated to work with the Office of the Chief Information and Privacy Officer, Ministry of Government Services, to ensure that the protection of personal health information. - The Ontario government created SSHA in 2003 to improve patient care through a variety of initiatives, including network hosting and secure e-mail. The agency has created the foundation for many of the eHealth activities underway today. The McGuinty government named Dr. Alan Hudson, Lead of Access to Services/Wait Times with the Ministry of Health and Long-Term Care, as board chair of eHealth Ontario - a restructured agency responsible for all aspects of eHealth in Ontario including creating an electronic health record for all Ontarians. Also named as board members are J. David Livingston, President and CEO of Infrastructure Ontario; Matthew Anderson, CEO of the Toronto Central Local Health Integration Network; Heather Sherrard, vice-president of clinical services at the University of Ottawa Heart Institute; and Ken Deane, Assistant Deputy Minister, Health System Accountability and Performance Division, Ministry of Health and Long-Term Care.